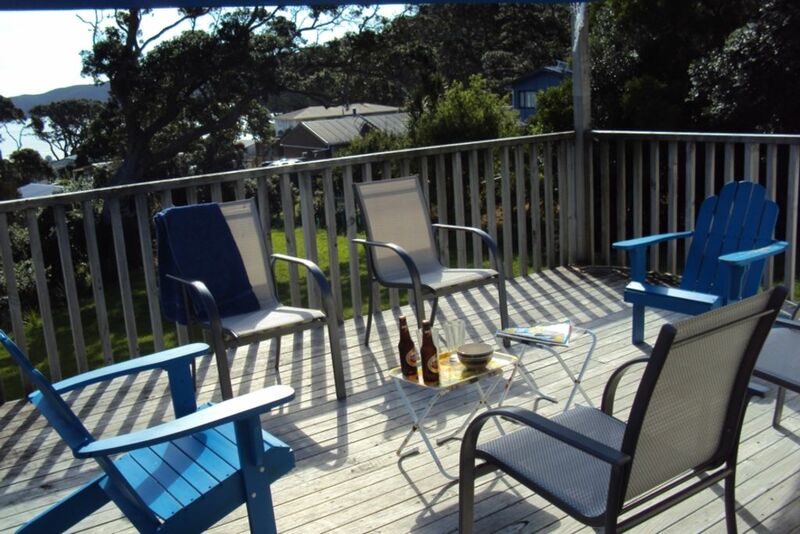 Molesworth’s is a holiday home available for rental by Island Accommodation on Great Barrier Island. It is perched on a hill overlooking Mulberry Grove Beach, Tryphena. The two bedrooms, which comfortably sleep four are perfect for a family. The house has a large yard for games and kicking back, with a small private garden at the rear for a quiet coffee and newspaper in the morning. Molesworth’s is tech-friendly, recent upgrades to the solar power system allow you to enjoy your laptop, tablet or mobile phones. Work on your journal or pipe your play list through our stereo with mp3 plug-in and enjoy other gadgets in a planet-friendly state-of-mind never once using a pica-watt of mains power. Molesworth’s typifies the New Zealand bach. Cosy and bathed in sunshine, you look down through the pohutukawa trees to the blue water of the bay only 150 metres away. Sitting at the rear of a large, v-shaped section, the house looks west over beautiful Tryphena Harbour. The two bedroom house has comfy new furnishings and is surrounded by expansive lawn and screened by trees. The wrap-around deck, nearly as big as the house, has great views of the bay and surrounding hills. Only minutes from the ferry and a short drive to the airfield, nearby there are a laundromat, post office, Irish pub, shops and historic sites. A beautiful, private place to base yourself to explore Great Barrier Island. Lovely location close to the wharf. Lovely little place, perfect size for us with a lovely view of the harbour. Easy access to the local food store and library. Lovely and tidy, clean, hot showers and everything you need for a weekend away. Excellent escape so surprisingly close to home. Glorious sunsets each night on the deck, incredible stars at 3 am, great scenic walks, and wonderful beaches. Bach worked well for us - easy access and good privacy. The only problem we had was with the mosquitos. Excellent fish n chips a short walk from bach. Definitely want to return to the Barrier. This bach is quite small and compact, but was very nicely presented and we enjoying staying here. A really cool little place. A really cool little place. Tidy and with a great view. Would definitely stay here again.